Bergstrom Automotive - Preferred pricing on new vehicle purchases plus any additional rebates and/or incentives and employee pricing on pre-owned vehicles or $500 off (whichever is lower). Valid at all Bergstrom Automotive locations in Oshkosh, Neenah, Green Bay and Appleton except luxury brands on Victory Lane. Print the flyer here. Offer must be mentioned to sales representative prior to purchase for verification of current membership. Constant Contact - An email marketing solution with customizable, mobile-responsive email templates. HBAFC member receive a discount on plans and can try it for free for 60 days! Click here for more info and to sign-up. Frankenmuth Insurance - Discounted rates, enhanced coverage options such as Contractors Errors & Omissions and Cyber Liability, Renewal Price Protection. Contact Curt Fritz, Ademino & Associates, 920-734-3110 or Ann Schneider, Maritime Insurance, 920-457-7781. HomeSphere - Provides cash rebates to builders who use certain building product manufacturers on homes that you build. The HomeSphere program is FREE, EASY to enroll and SIMPLE to submit. If you are interested in registering for this rebate program, contact Melissa Wolf, and let her know that you're a member of Home Builders Association of the Fox Cities in Appleton, WI, and that we made you aware of this opportunity. Munn Co. - MunnCo’s innovative portfolio of vendors provides numerous services to increase efficiency, grow your business and boost profits. MunnCo has aggregated the buying power of tens of thousands of companies together to negotiate top-tier pricing on various business services. Become a MunnCo Member today and receive access to our premium discounts! National Purchasing Partners (NPP) - HBA Fox Cities has contracted with National Purchasing Partners (NPP) to administer a group purchasing program which allows members to purchase goods and services directly from vendors at discounted prices. Prescription Savings Card - HBA Fox Cities members can get a FREE prescription drug card. Click here to download your pre-activated card and start getting immediate savings with no paperwork to fill out, no limits on usage, and no health restrictions. Save up to 75% on prescriptions. Secura Insurance - Exclusive discount on insurance policies and are eligible for home builders association-sponsored safety training. View more information here. Contact Casey Haen, 920-358-4141. 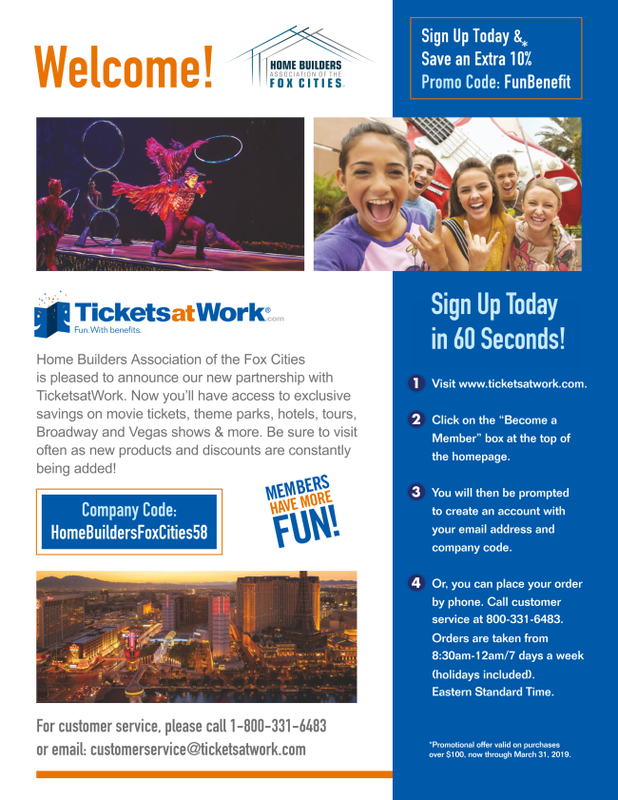 Tickets at Work - HBA Fox Cities has partnered with Tickets at Work to provide members with discounts at various amusement parks, hotels and so much more. Click here to download a flyer that contains HBA Fox Cities' exclusive company code.